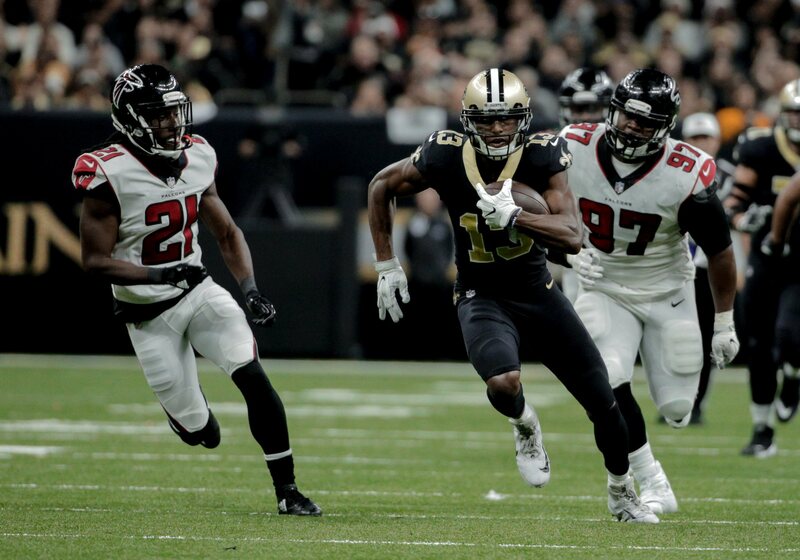 The (9-1) New Orleans Saints will be seeking their 10th straight victory this Thursday Night (Thanksgiving) when they host their bitterly-hated and despised NFC South Division arch-rivals the Atlanta Falcons at the Mercedes-Benz Superdome. Kickoff is at 7:20 P.M. Central time and will be broadcast nationally by NBC Sports. Despite their (4-6) record, the Falcons are still one of the more dangerous and competitive teams in the entire NFL, led by 11th-year veteran quarterback Matt Ryan, and star wide receivers, Julio Jones and Calvin Ridley. Nevertheless: the Saints are heavily favored (by 14 points as of this writing) to win this highly-anticipated contest. 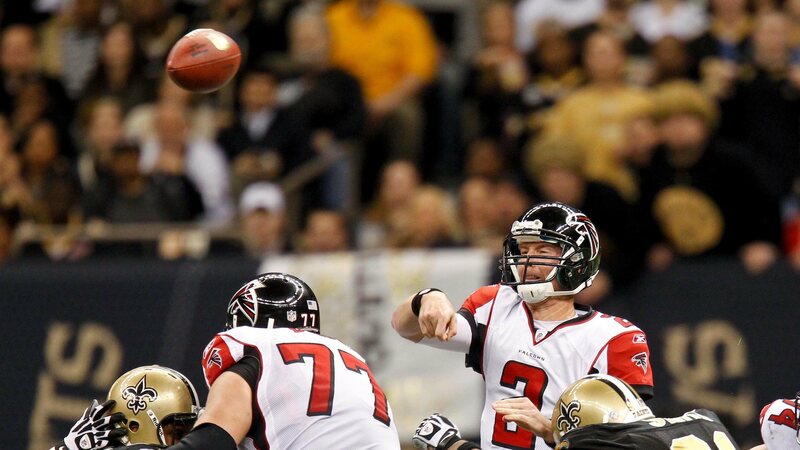 The last time that New Orleans and Atlanta faced each other was in Week #3 at Mercedes-Benz Stadium in Atlanta. 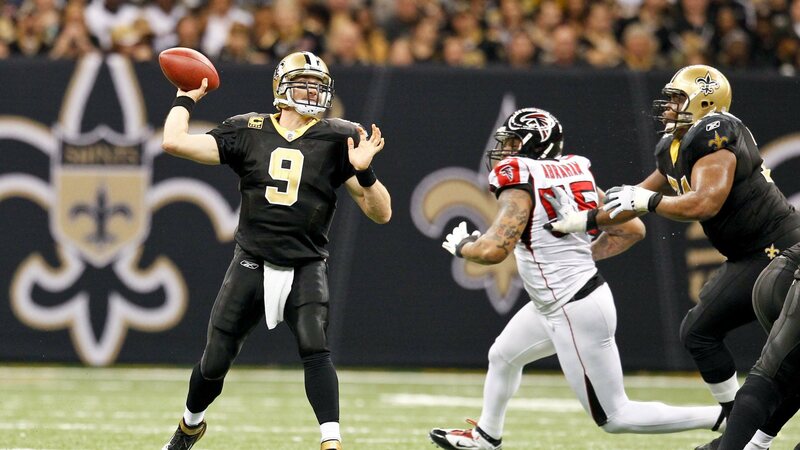 During that game, the Saints came from behind to win in overtime by a score of 43-37. In that particular contest, the Saints were able to score the game-tying touchdown with only 1:15 left to play, and then subsequently won the coin toss prior to overtime, where they then were able to march 80 yards down the field for the game-winning points. It’s with all of that in mind this morning, thatBig Easy Magazine presents 5 Bold Predictions for this Thursday afternoon’s contest as the New Orleans Saints attempt to win their 10th straight game, at home inside of the Mercedes-Benz Superdome against their hated arch rival, the Atlanta Falcons. Davenport, who has missed the past three games with an injury to the big toe on his right foot, is expected to return in this contest on Thanksgiving night, and it could have huge ramifications upon the eventual outcome between these two long-time enemies. The team’s top 2018 draft pick out of the University of Texas at San Antonio has been Pro Football Focus’ #1-rated rookie edge pass-rusher this year in spite of the time that he’s missed; with four sacks and seven quarterback “hits,”. The website notes that their “run stop percentage” stat has him graded the best in the entire League at 9.8%. In this Thanksgiving Night contest Davenport makes his presence felt immediately, and as a direct result, it completely throws Falcons quarterback Matt Ryan (a.k.a. “Matty Ice”) out of his rhythm. Davenport will tally two sacks, three quarterback hits, four quarterback pressures, and a tackle for loss on Falcons rookie running back Ito Smith; as his performance boosts a still-shaky-at-times Saints defensive secondary that still gives up big plays on occasion. But Davenport’s harassment of Ryan will subsequently hinder that probability. Much like Davenport will have an immediate impact for the Saints defense in his return from a previous injury, so to will Falcons linebacker and 3rd year NFL veteran Deion Jones – the former high school star at local New Orleans Jesuit High School and at LSU who last played for the Dirty Birds defense back in Week #1. Jones suffered a broken foot in Atlanta’s season opener, and his return is expected to help bolster a Falcons defense that has struggled mightily this year mostly due to multiple season-ending injuries to a handful of key contributors. The Falcons defensive unit as a whole has allowed 20 or more points in 8 out of their 10 games this season, and they have only forced only nine turnovers this season — which ranks them near the bottom of the NFL in that category. But with Jones back in the line-up and playing in front of friends and family on Thanksgiving night, the Falcons defense at least plays better in this contest; as the former Blue Jays’ All-District 9-5A defender tallies a sack, a PBU (pass break-up), and a tackle for loss against the high-powered Saints offense. If you’re reading this as a Saints fan, then you don’t need to be told or reminded of the type of phenomenal year that Thomas — the sensational young superstar and Saints 3rd-year veteran wide receiver — is currently having. This past Sunday in the team’s 48-7 rout of the defending World Champion Philadelphia Eagles, the former Ohio State University star became the first Saints player in the franchise’s entire 52-year history to surpass 1,000 yards receiving in each of his first three seasons. In 10 total games this year, Thomas has caught 82 passes for 1,042 yards and eight touchdowns. In the Thanksgiving contest tomorrow night, Falcons #1 cornerback Marcus Trufant will be tasked yet again with covering Thomas one-on-one for a majority of the game; but he won’t fare that well as the Saints big-time play-maker “takes him to school” in this one. Thomas will haul in a total of 8 receptions for 172 yards and 2 TD’s, with most of the yardage coming on two huge “chunk plays” in which the former Buckeye grabs a pair of long receptions over Trufant of 30 yards-plus. While the return of Marcus Davenport in our first prediction should give the Saints secondary a boost with getting pressure on Matt Ryan, the Falcons quarterback still has a very talented array of wide receivers at his disposal. In fact, it’s the very same receiver group that torched the Saints pass defense to the tune of 26 receptions, 374 receiving yards, and FIVE TOUCHDOWN passes at Atlanta back in Week #3. Falcons #1 wide receiver Julio Jones has gotten himself on track after a slow start to his season, and the former University of Alabama star has caught a touchdown pass in three straight games after not having a single score in any of the Falcons’ first seven games this season. Jones currently has recorded five straight games of 100 receiving yards or more; his latest coming this past Sunday when he totaled 118 yards on six receptions versus Dallas. In the first meeting between the Falcons and Saints back in that Week #3 contest at Atlanta, Jones had five catches for 96 yards. In his entire eight-year NFL career against New Orleans, Jones has 80 receptions for 1,254 yards in 14 career match-ups. 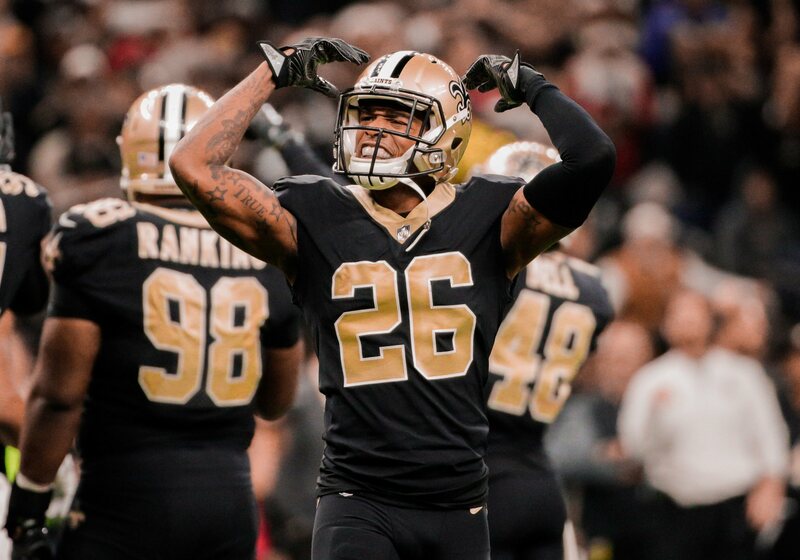 But surprisingly, in this match-up, it’s not Jones that the Saints secondary will be worried about — as #1 Saints cornerback Marshon Lattimore will keep Jones at bay. But fellow cornerbacks Eli Apple and PJ Williams won’t fare as well as Lattimore. Each player surrenders touchdowns in pass coverage to Falcons wide receivers Calvin Ridley and Mohammed Sanu, which helps Atlanta to remain in the game as the contest enters into the 4th and final quarter. 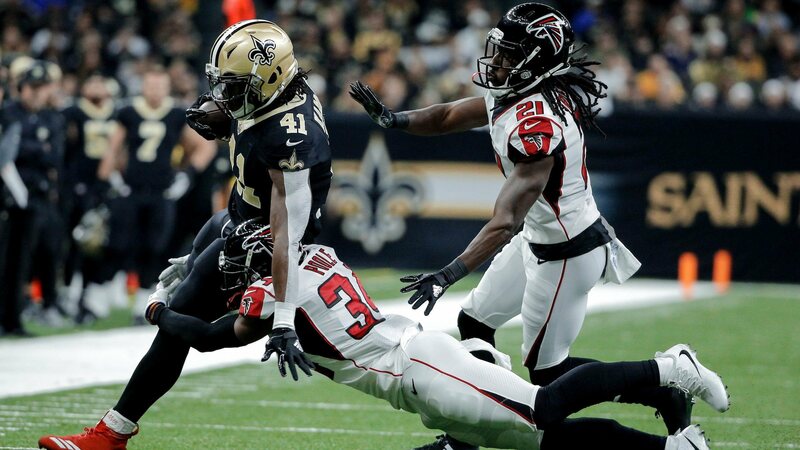 …Second-year superstar running back Alvin Kamara catches a swing pass from Brees and breaks a potential tackle-for-loss in the backfield by the NOLA native and Falcons linebacker Deion Jones, before rambling 52 yards down to the Atlanta 17-yard line. But the drive stalls on a 3rd down pass attempt from Brees to tight end Ben Watson, and the Saints are forced to settle for a Wil Lutz field goal that puts the Saints up by 10 points with a score of 34-24. On the ensuing kickoff, the Falcons put Ridley in the line-up on special teams to return the kick-off, and the impressive Falcons rookie wide receiver and play-maker returns the kickoff 102 yards for the score to pull Atlanta to within 34-31, as a stunned Superdome crowd watches on in disbelief in what is yet another typically wild game in this long-time rivalry. But the Saints then get the ball back and march right down the field, and a Brees-to-Tre’Quan Smith touchdown puts New Orleans back up by 10 points and a 41-31 lead. Atlanta gets the ball back. knowing that they have to try and match New Orleans score for score — but as that old saying goes: “the best-laid plans of mice and men often go awry.” As “Matty Ice” drops back to pass on 1st down from their own 35-yard line, he is hit from behind by the rookie Davenport, and the ball bounces right into the hands of Saints linebacker Demario Davis; who is “Johnny on the spot” and returns the ball 30 yards for the defensive touchdown, putting New Orleans ahead by a score of 48-31. Barry Hirstius is a semi-retired journalist, who has worked as a sports editor and columnist and regularly appears on ESPN Radio New Orleans 100.3 FM “The Sports Hangover Show”. Barry is a New Orleans native who grew up as a fan of the Saints while attending games as a young boy at the old Tulane Stadium. He is the proud Grandfather of two beautiful young girls, Jasmine and Serenity. Be sure to view his other predictions, articles, and Saints game recaps here. HEY FALCUNTS, PREPARE CAUSE TOMORROW NIGHT YOUR WORST NIGHTMARE IS COMING!!! !